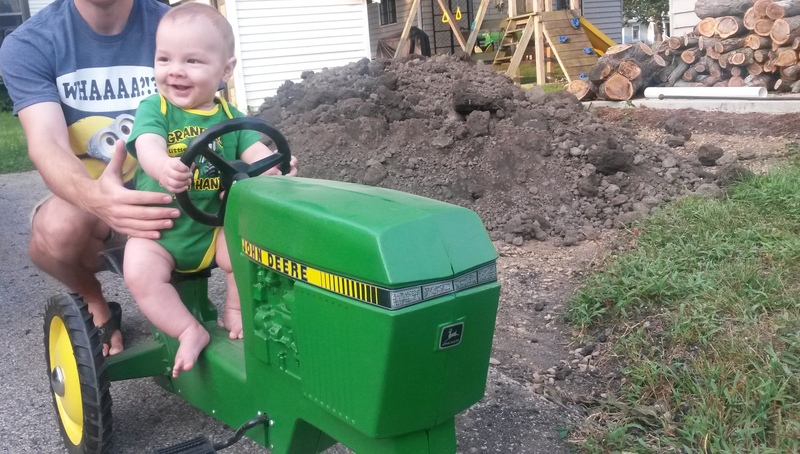 Thanks Great Uncle Greg for the peddle tractor! Now if I can just get Frugal Boy to level out that mound of dirt in the background. A little while back, I replaced the front struts on our 15 year old car. While I was doing that work, I noticed that several other parts in the wheel well were looking past their prime. It is recommended that you have your car aligned after replacing struts so in the interest of only having to do that once, I decided to replace some other parts that would also need an alignment. 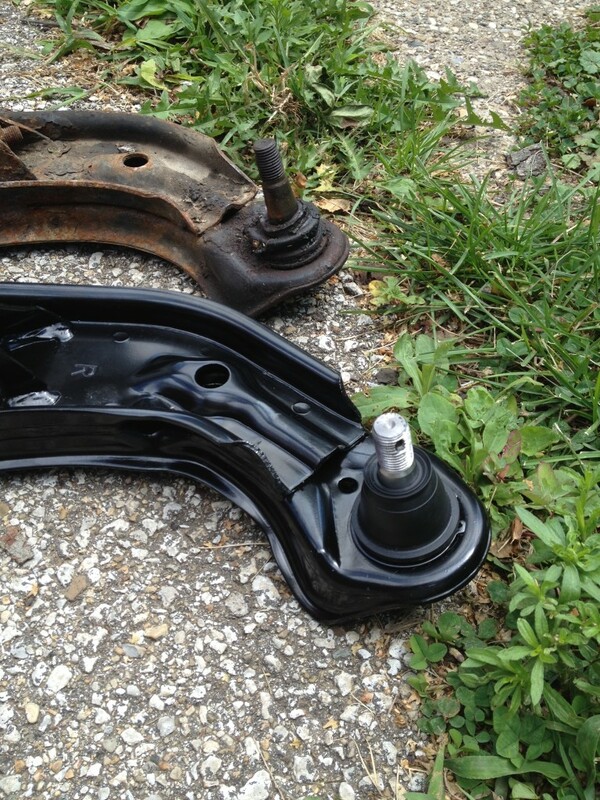 The first item on the list was new inner and outer tie rods. 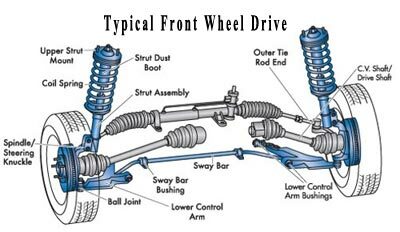 Tie rods push and pull the wheels in and out, or in other words make the car turn left or right. They are also one of the parts that is adjusted during an alignment. The red arrow points to the outer tie rod. 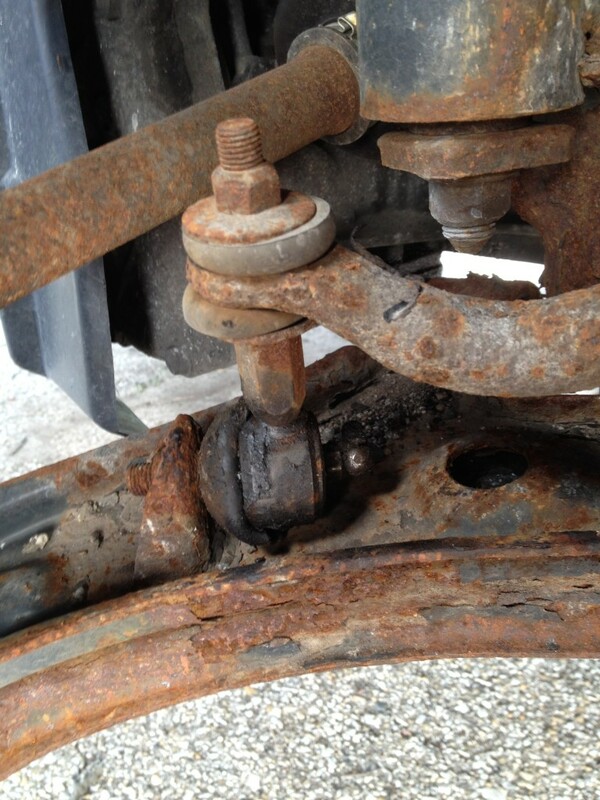 The outer tie rod is the most common and easiest part to replace of the entire steering arm. The green arrow points to a lock nut. 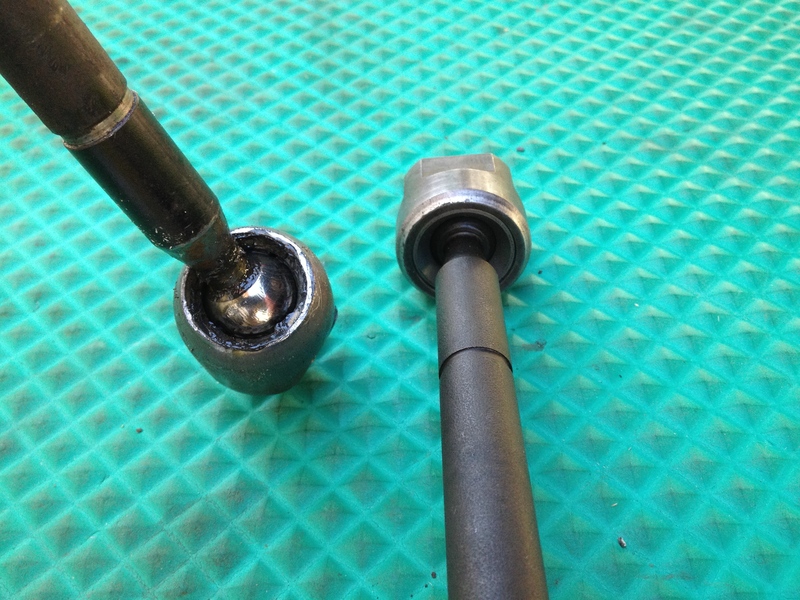 This nut is used to adjust how far or close the outer tie rod sits from the center of the car. Mechanics will adjust this nut as part of your alignment. 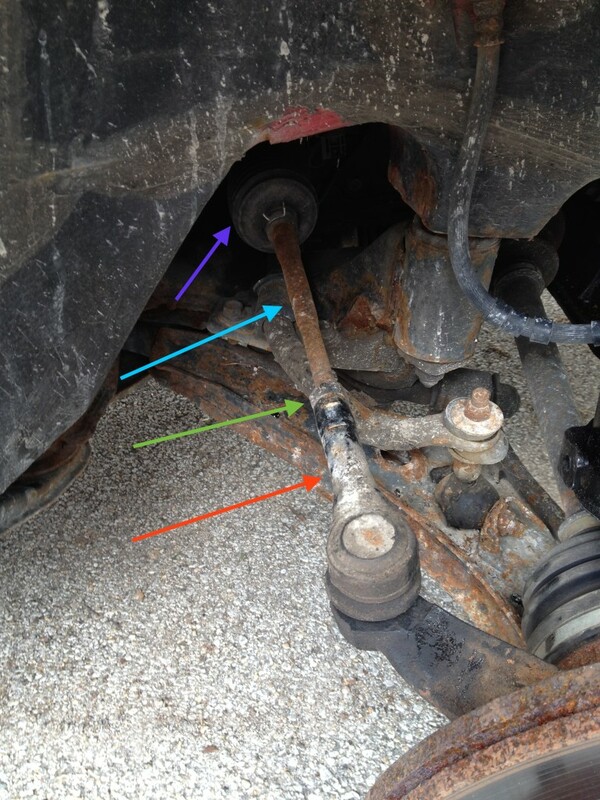 The blue arrow points to the inner tie rod. 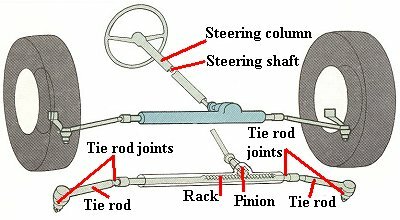 Sometimes it is called a steering rod and it threads onto the rack and pinion. 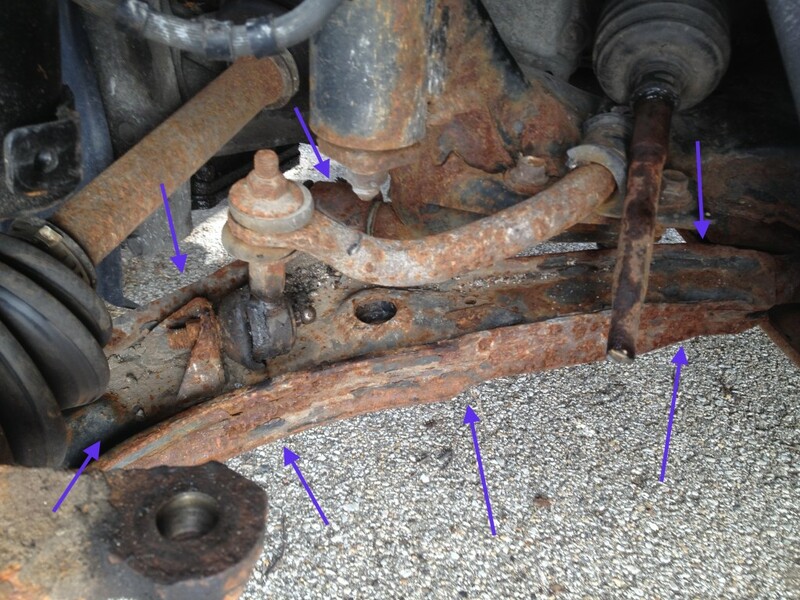 The purple arrow shows the dust boot that keeps the inner tie rods connection with the rack and pinion clean. 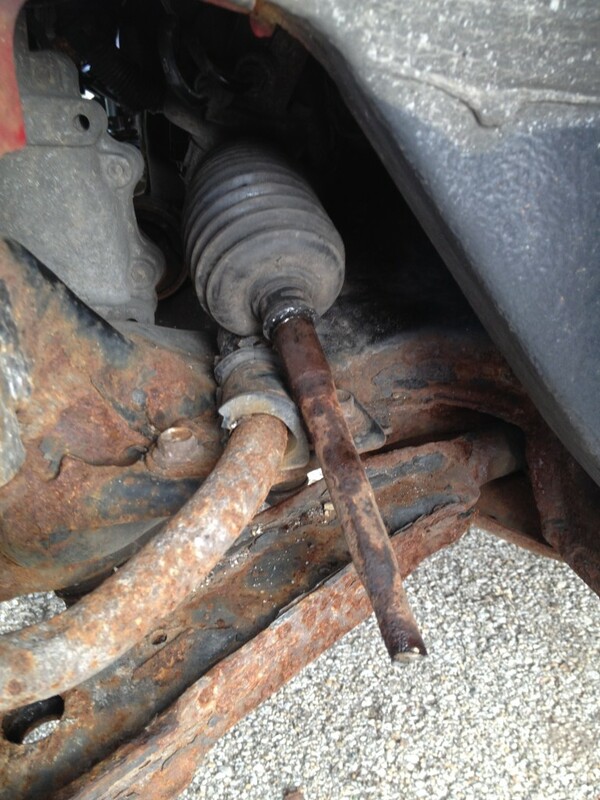 First things first, we’ll need to remove the outer tie rod. In my case, it was so rusted onto the inner tie rod and I already was planning on replacing the inner that I simply cut it off with an angle grinder. 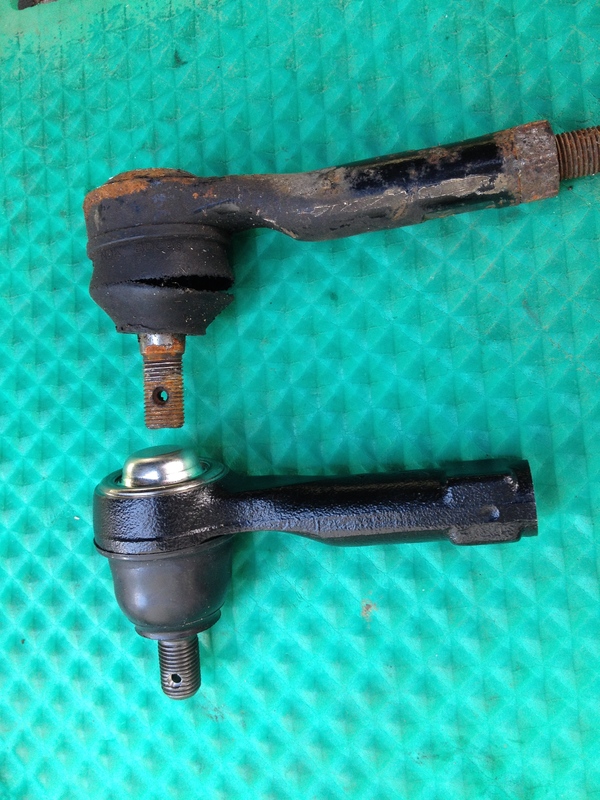 Here you can see the old outer tie rod next to a new one. One of the main reasons that you would need to replace an outer tie rod is because the rubber boot protecting the ball bearing is cracked. Once that is cracked, grit can get into the bearing and it will quickly wear out. I was able to find the exact same tie rod end for $7/pc on RockAuto.com. Taking off the dust boot gives you access to the inner tie rod. I had to borrow a loaner tool from the auto parts store to remove the inner tie rod. 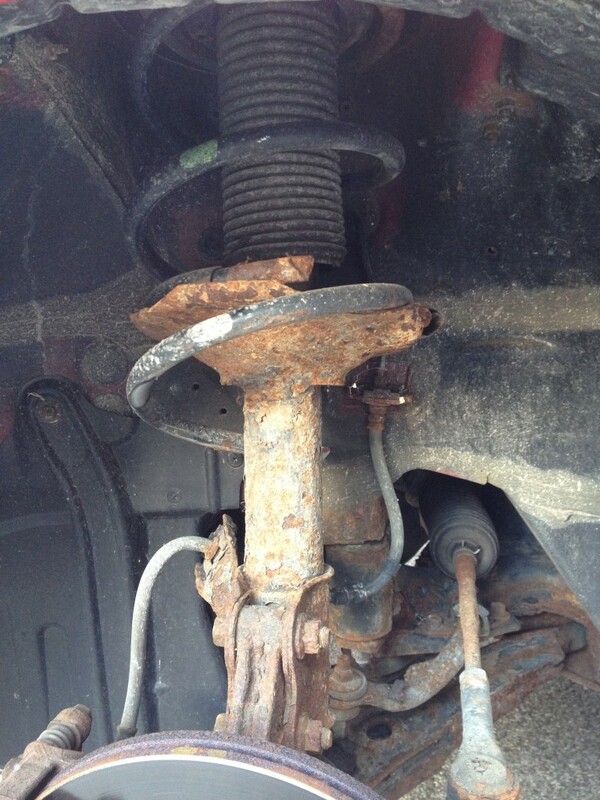 The inner tie rod has a ball joint where it hooks up to the rack and pinion. This ball joint should be firm, but the ones I removed could easily be moved around with my pinky finger. Assembly is the reverse and fairly easy. Moving right along, the next part that I wanted to replace on both sides was the lower ball bearings. 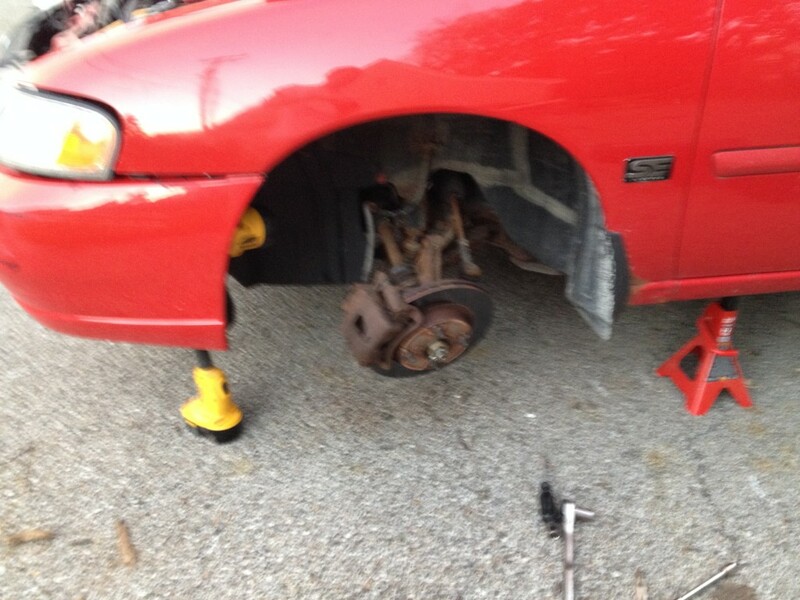 Unfortunately, for this car, you have to replace the entire control arm with the bearings already pressed in. 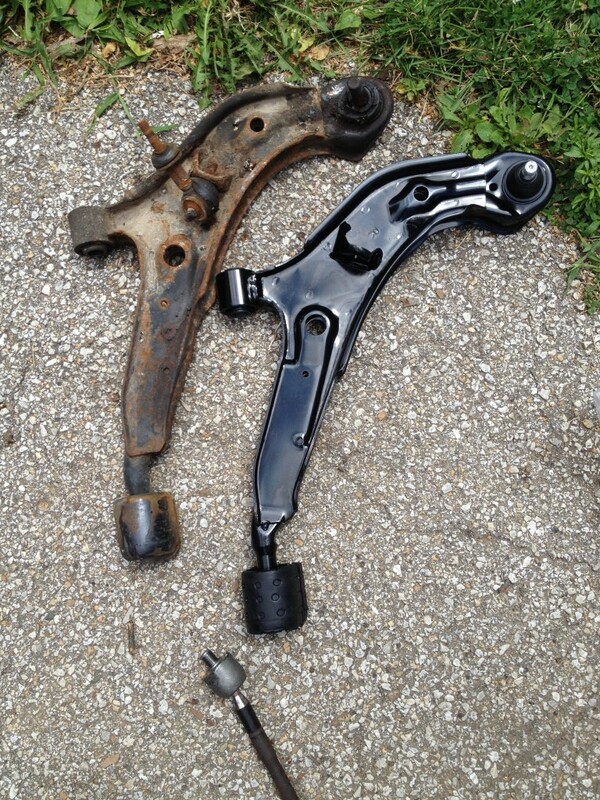 Here is a picture of the whole control arm. and this is the lower ball bearing that connects the control arm to the steering knuckle. 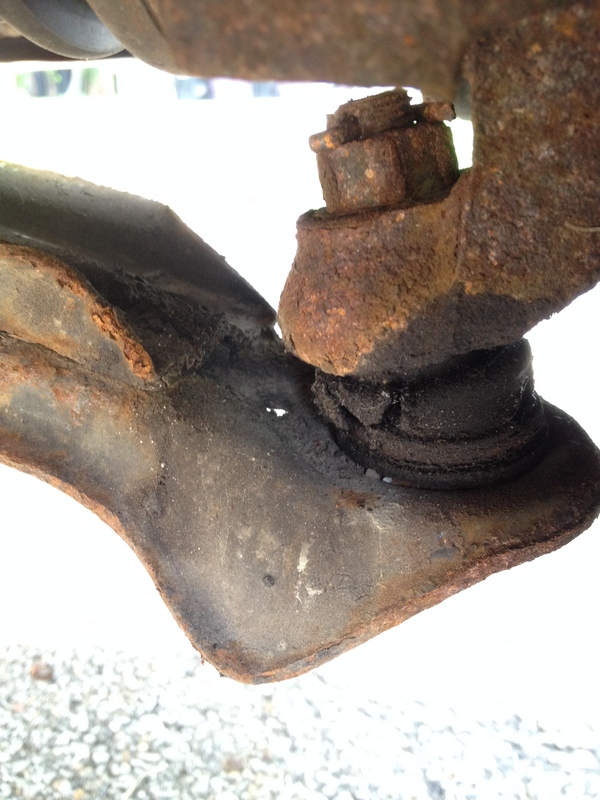 Like the outer tie rod, once the protective rubber boot cracks and opens up, the bearing is doomed. These parts are so close to the wheel and road that they are subjected to a constant barrage of grit and grime. 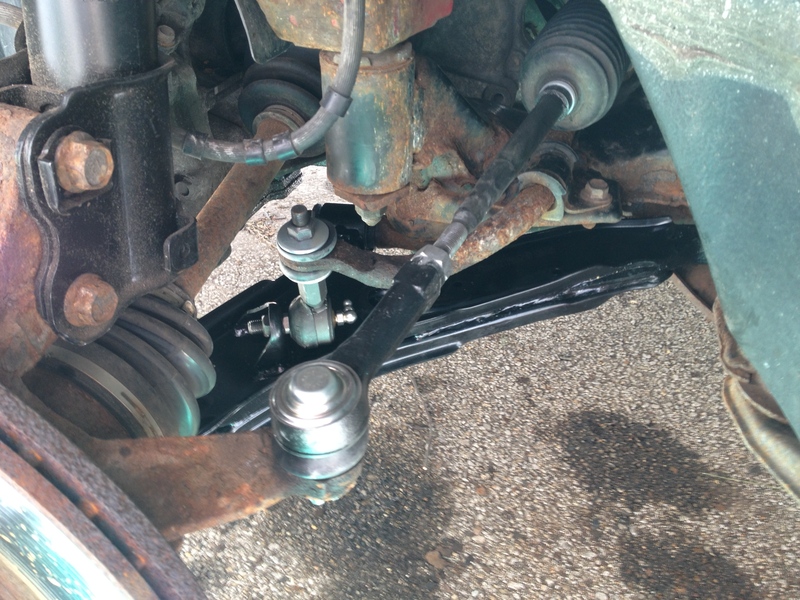 In order to remove the control arm, you must also disconnect the stabilizer bar link (sometimes referred to as a sway bar). The sway bar runs underneath your car and connects the left and right control arms together. When you’re speeding down the road and make a hard turn, this bar will transfer some of the suspension load from one side to the other. I found new links for $15/pc. Removing the control arm was pretty difficult for me. There are 4 connection points to the car (including the sway bar link). The connection to the steering knuckle was the hardest because there is only room for a crescent wrench and the nuts were severely corroded. 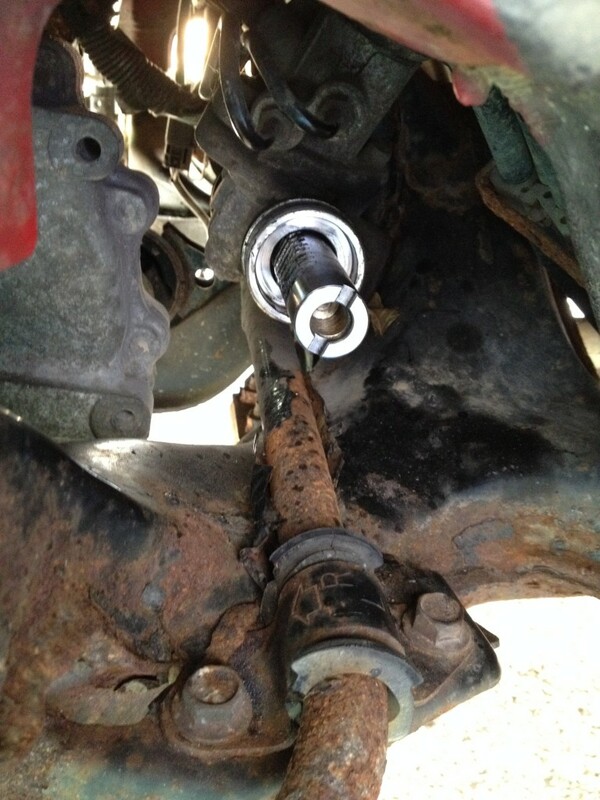 The other difficult step was removing the 3 bolts that secure the rear bushing of the control arm. Red loctite was used on at least one of the bolts. Loctite is a special kind of glue used to hold bolts in place. It comes in two common varieties, red and blue. Blue can be removed with hand tools, but red has to be heated up to 550° F. My 300 ft lb impact wrench was no match for the red thread locker so I had to use a propane torch and heat it up (I only caught the lubricating/penetrating oil on fire twice). After all of the blood, sweat, and smoke I finally ended up getting the old control arms out. This was the part that I really wanted to replace. Install is the reverse. 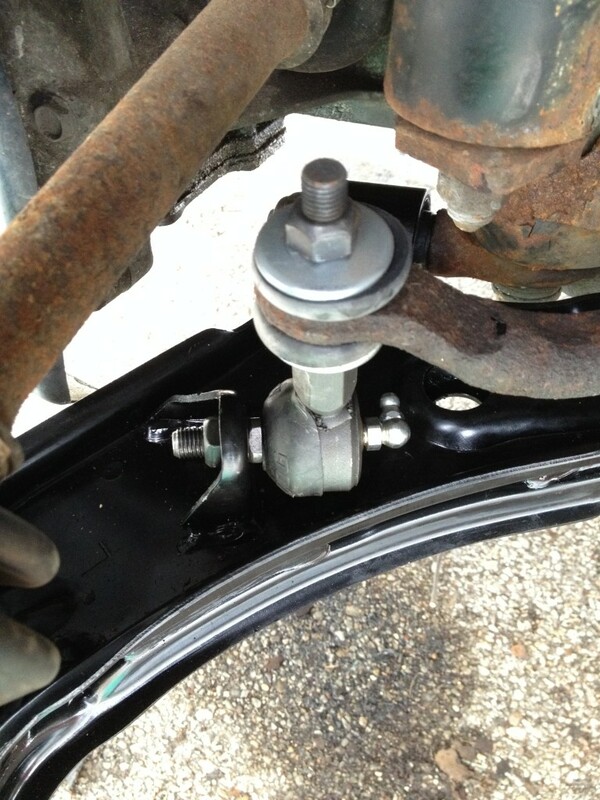 Here is one of the new sway bar links installed. The lower ball bearing looks much happier now. 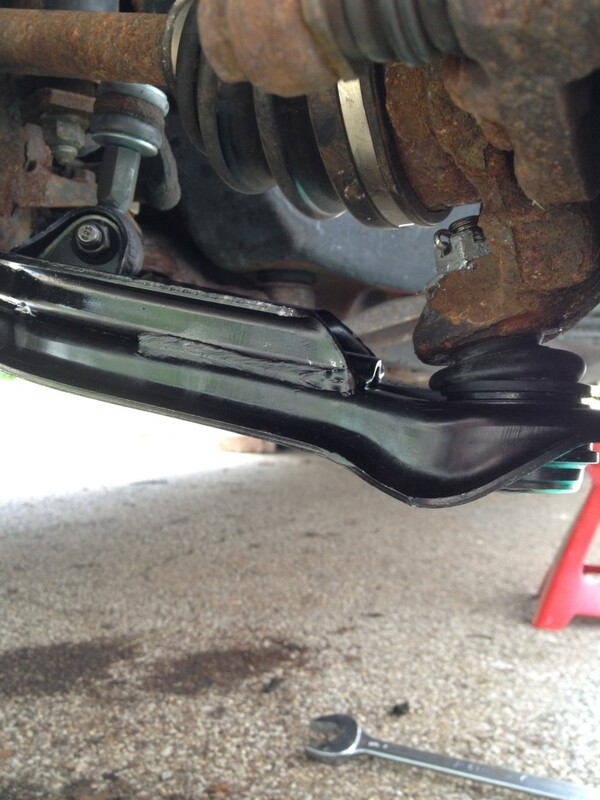 Here you can see the tie rods, control arm, and sway bar linked installed. 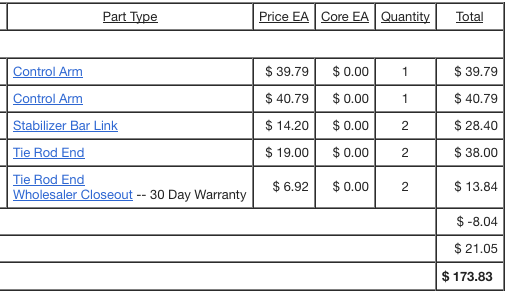 All of the parts set me back $174. Would I do all of that work again? Probably not. It was a good learning experience, but we will most likely be selling this car within the next six months. 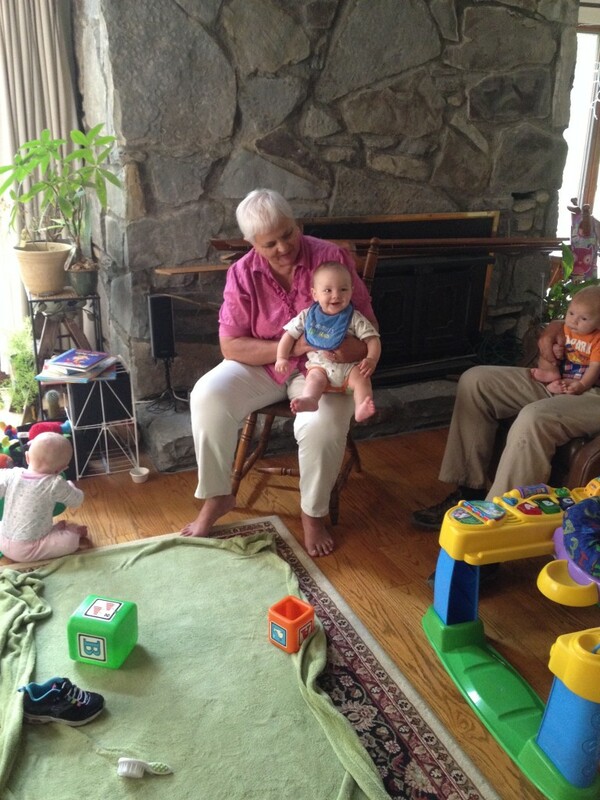 This past weekend we loaded up Frugal Boy in the car and visited family in Kentucky. 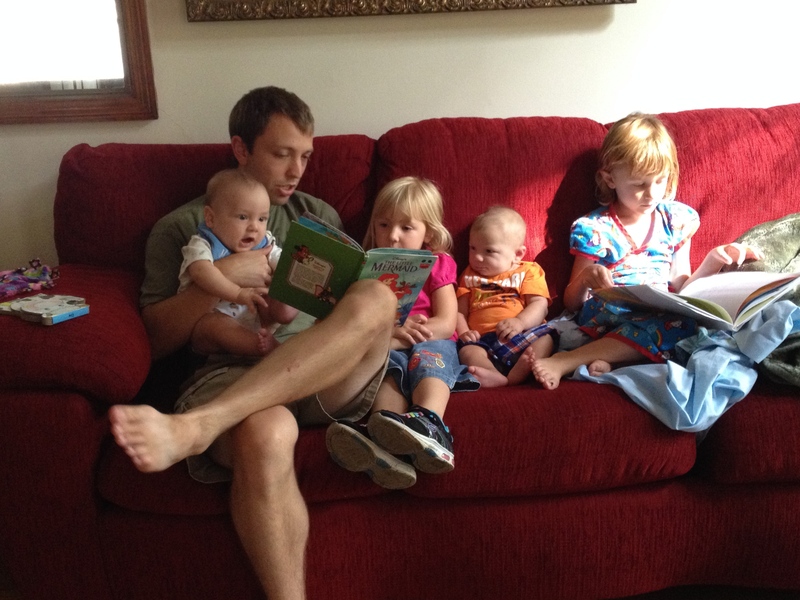 It’s nice having some cousins his age because it lets us parents share supplies and advice. 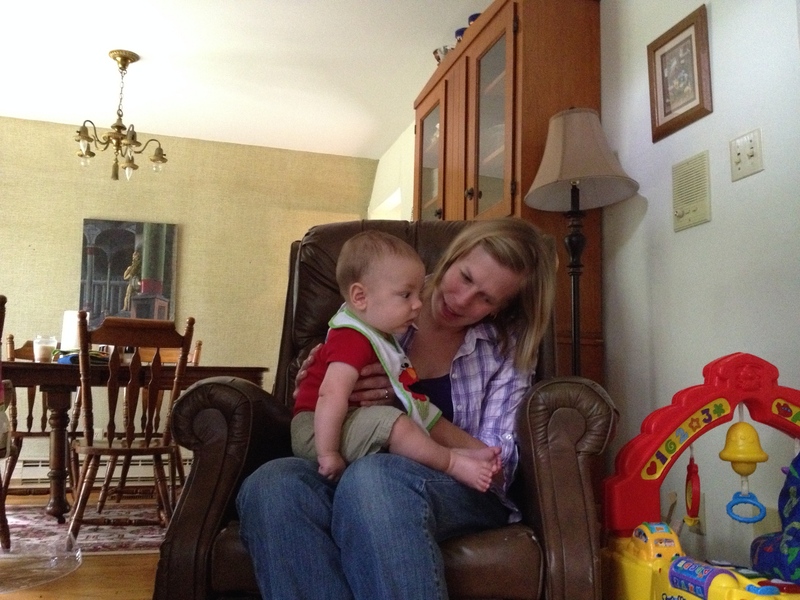 Thanks Aunt Sarah for looking after Frugal Boy for awhile! 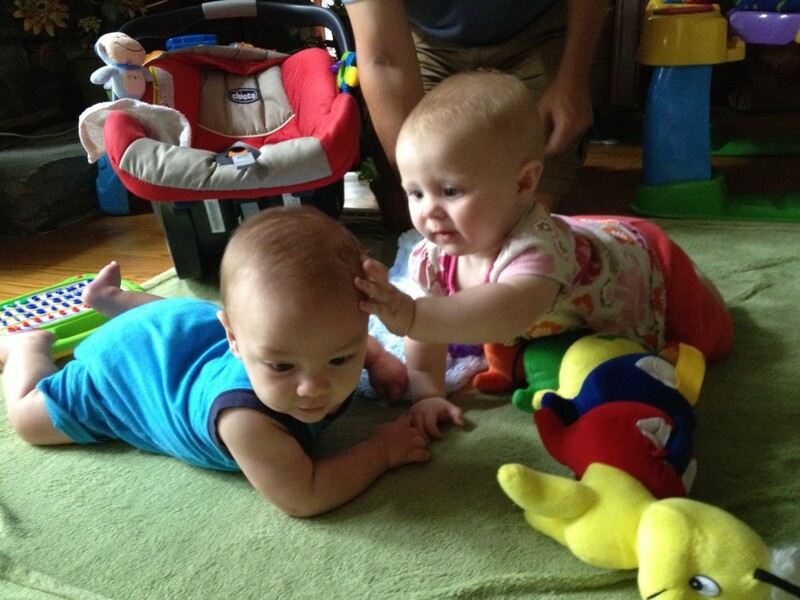 Here is a slightly younger cousin. I keep trying to turn Frugal Boy into a water baby, but he still hasn’t gotten excited about pools. Visiting family means a whole new set of toys to play with. 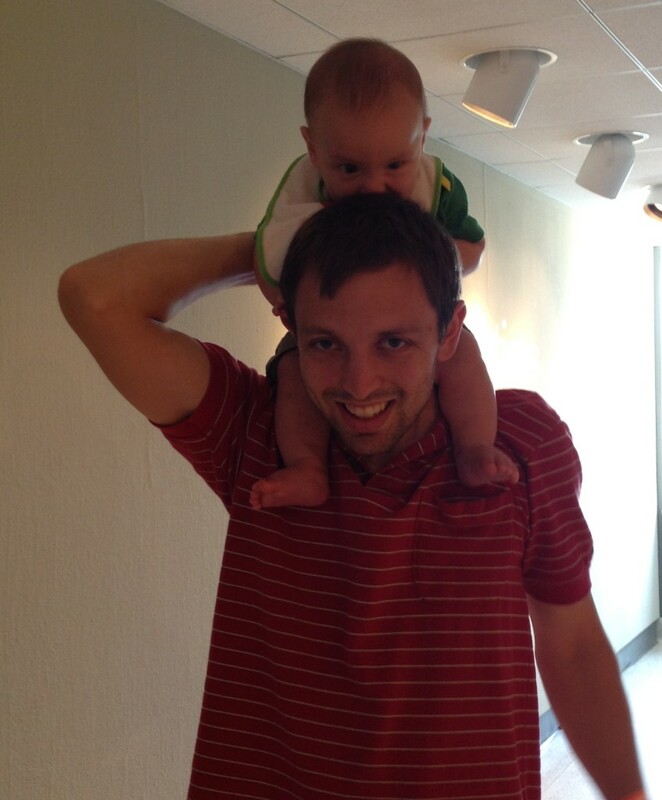 The Little Mermaid was a short distraction. Frugal Boy lost the somber competition. 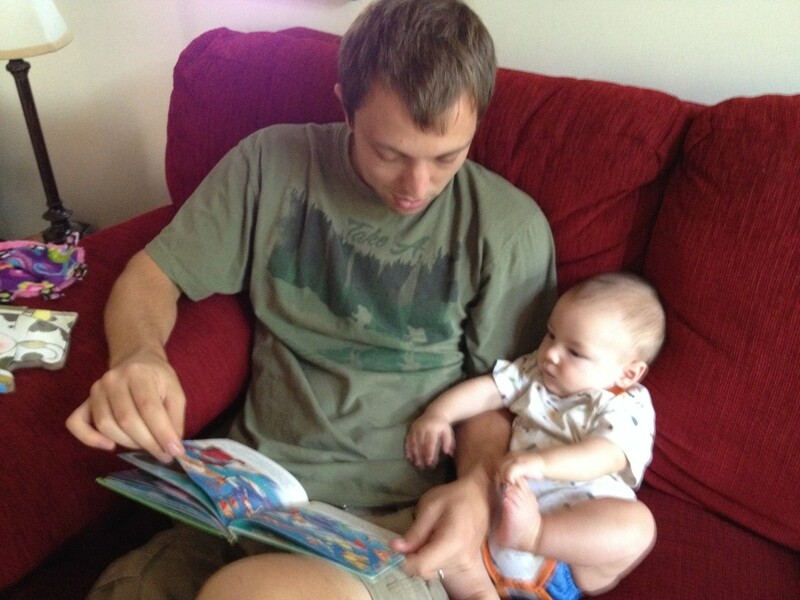 but he did score some Grandma time. The drive there and back was pretty good (even better than the trip to Missouri). Frugal Boy had some new toys to keep him entertained. 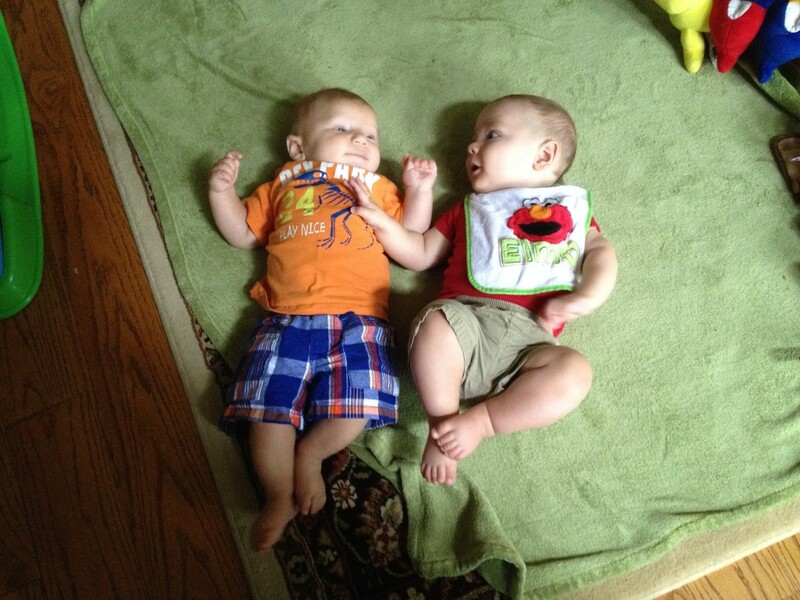 The string on this clip was almost as good as the pacifier itself. 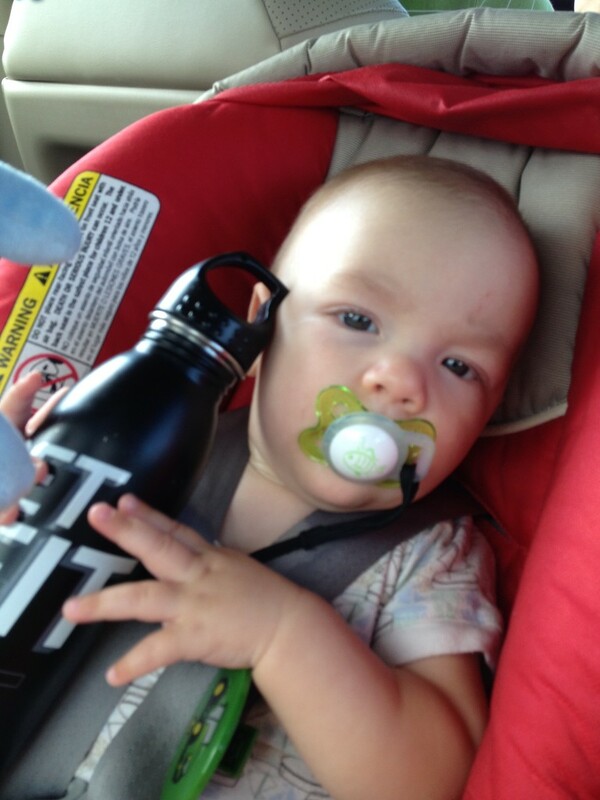 Who needs a cuddly teddy bear when you can hold a stainless steel water bottle? Thanks to all of our family members that made food and entertained Frugal Boy. 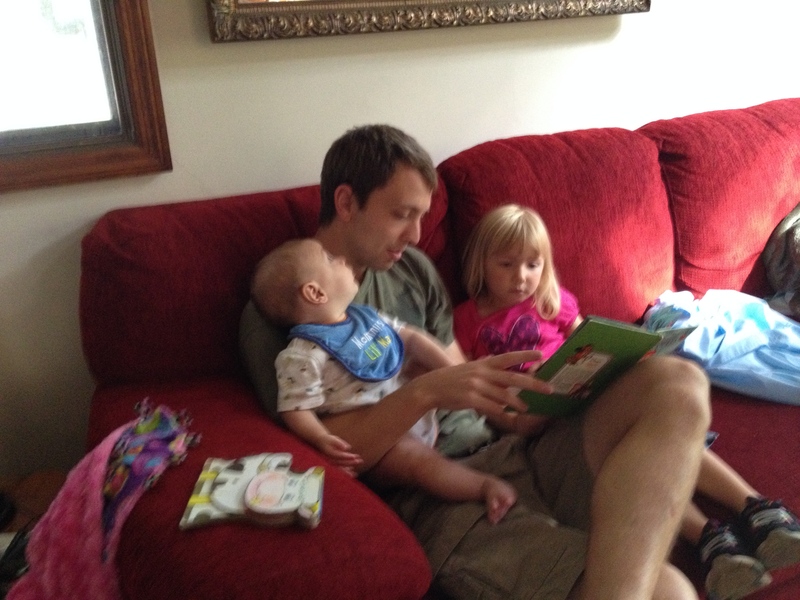 It was a nice break from the daily grind! I was driving down the alley last week to pick up Frugal Boy from the babysitter when out of no where a loud boom emitted from the front end of the car. Shocked, I hit the brake and put it into park, then quickly turned the ignition off. A couple of framing carpenters working nearby had also been startled and one of my neighbors who happened to be out came running over. Together we looked underneath the car to see what had fallen off or what was dragging. Our cursory glance did not reveal any smoking gun, only a piece of curved metal that had sheared/snapped off, and since I still needed to pick up Frugal Boy, I decided to try and get the car back into its parking space. The car shaked and shuttered while in slow reverse but it covered the short distance. Later that evening after letting the question simmer in the back of my mind I had an idea of what it might be. A quick check later and I had found the culprit. The front driver’s side spring coil had blown out. 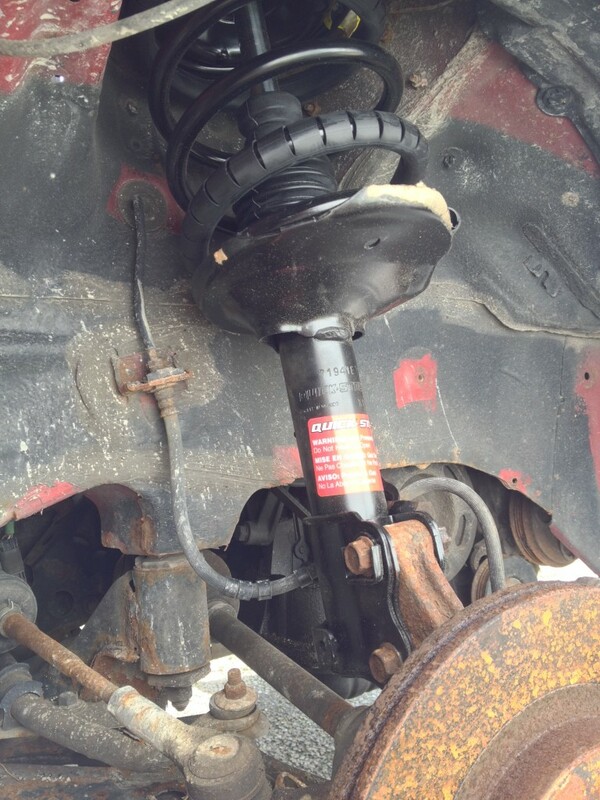 The giant metal spring works along with the strut to form a critical component of a cars suspension system. That suspension system turns pot holes and speed bumps from jarring impacts to soft bumps. 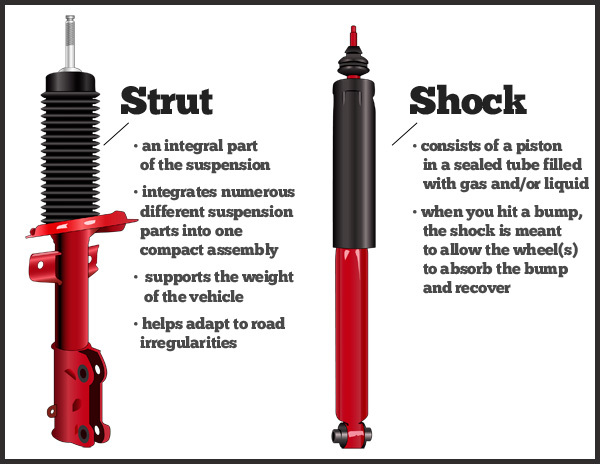 A common misconception is that shocks and struts are the same thing. While they perform the same function, smoothing out your ride, they work slightly differently. 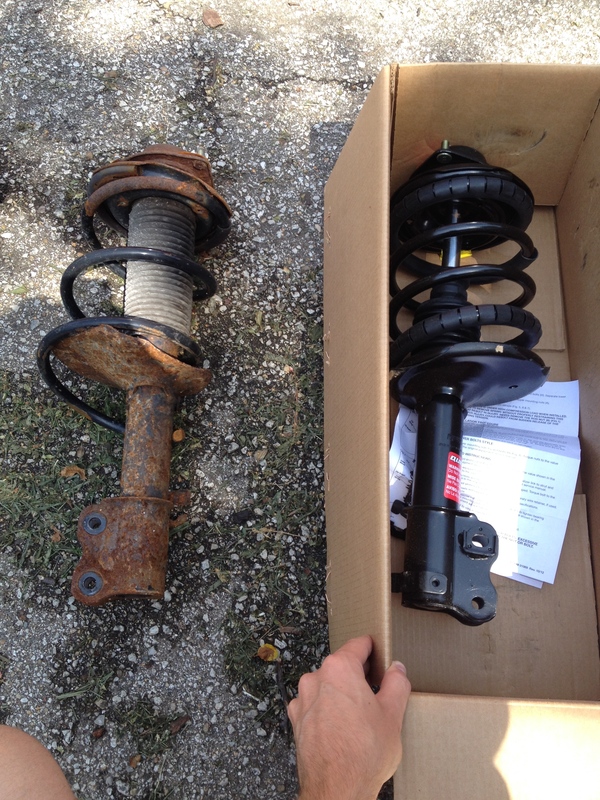 Some cars have struts on the front and shocks on the back while others have struts or shocks on the front and back. 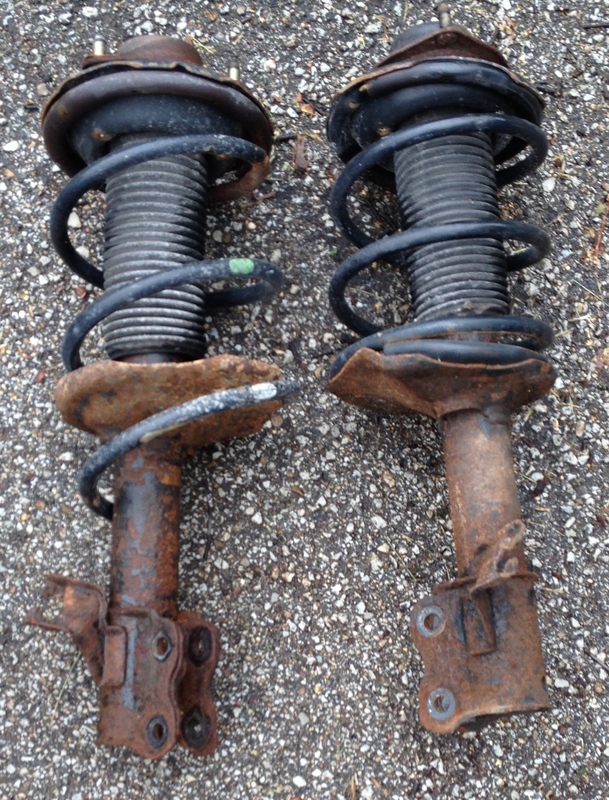 Either way, you have to replace A with A and B with B.
Shocks and struts should always be replaced in pairs. Since the front drivers side broke, I also needed to replace the intact (I wouldn’t go so far as to say “functioning”) passenger strut. Removal was surprisingly easy. Not including the wheel lug nuts, there were a total of 5 bolts to remove for each strut. sorry for the blurry photo, it was starting to get dark outside. While the video goes on and on about coil compression and the possibility of maiming yourself, I opted for the safer and easier route and just purchased a preassembled strut+coil. To my astonishment, the cheapest retailer that I found for the two preassembled struts wasn’t my local NAPA store, or Autozone, or Advanced Auto Parts. It was Amazon! By waiting 5-8 days for free shipping, I was able to save $120 over NAPA, the only brick and mortar in town that had the part in stock. The grand total was $200 in parts ($100 per side) and after using an Amazon gift card and some credit card points I had knocked the out of pocket cost down to $166. Labor took me a total of 4 hours, two to disassemble and two to reassemble. For a little comparison, back in January of 2013 I took our other car into a nationally operated chain garage to replace the struts (on the front) and shocks (on the rear). The front ended up costing us $467. $112 of that was labor and the other $355 was parts. Amazon has those same parts for $258. If I had done that job myself, I would have saved the labor and price part difference for a total of $209. For those of you saying your time is worth a lot, in my case it worked out to $28/hour and that’s because I am an amateur and have to waste time finding the tool I just put down. 3 sockets sized 15mm, 17mm, and 19mm? The biggest and most important tool in your toolbox is confidence. A great way to gain confidence is to start with smaller, simpler jobs such as filling the windshield wiper fluid, replacing wiper blades, and changing the oil. 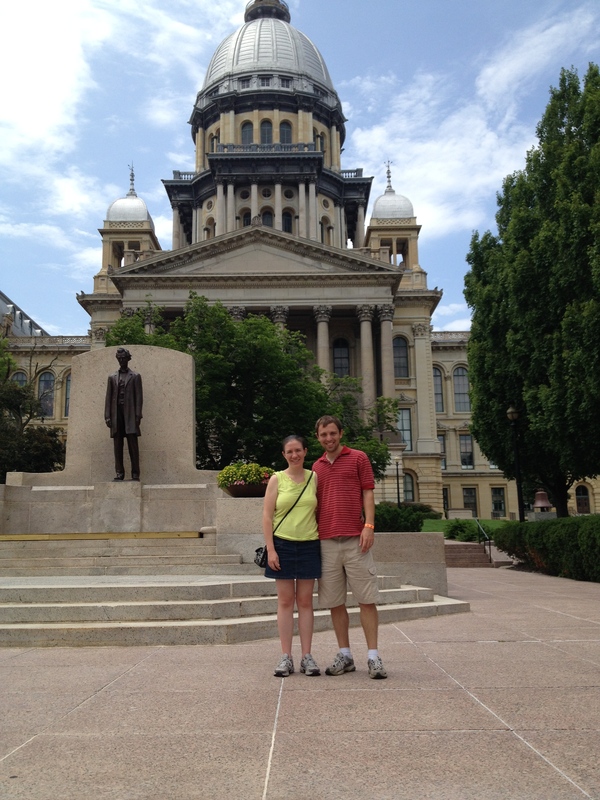 This past weekend my in-laws were visiting nearby and graciously invited us to tag along on a day trip to Springfield. 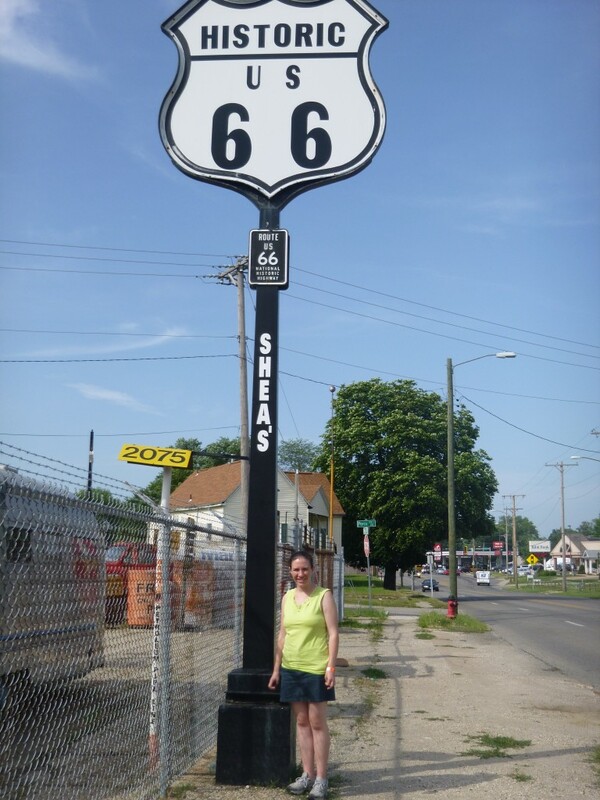 Instead of zipping there on the interstate, we opted to take a well known, but lightly treaded path known as Route 66. 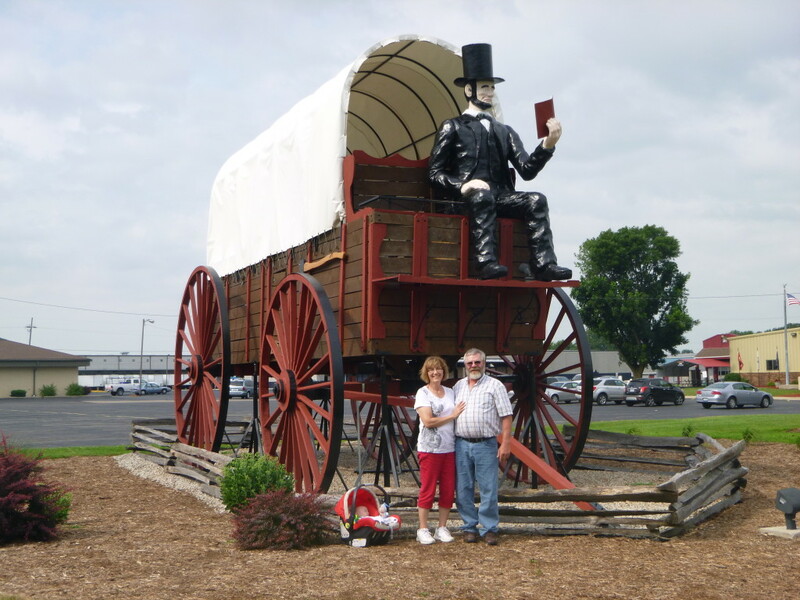 Even though we only drove along a short section of the historic roadway, we did pass by several iconic, larger than life, roadside attractions. 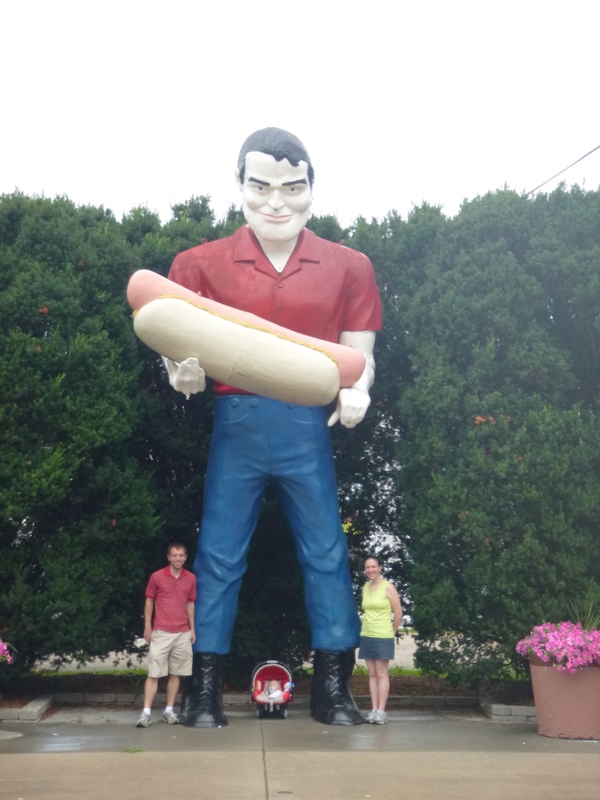 This Paul Bunyan statue is holding a giant hot dog. We learned from reading the sign that a single Paul Bunyan mould was used to create a number of statues. 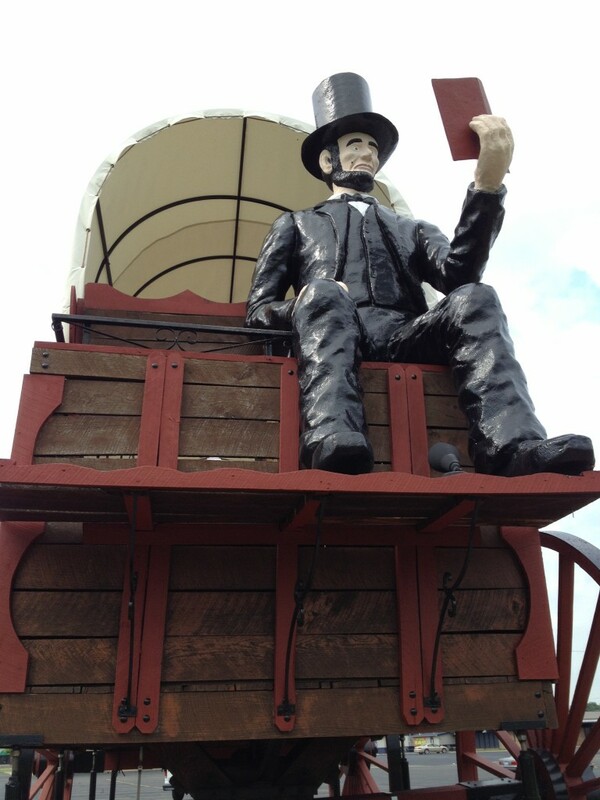 The original mould was designed for him to hold an ax, but as other businesses adopted the giant mascot, they retrofitted him with whatever merchandise they were peddling (or whatever they thought would get motorists attention). 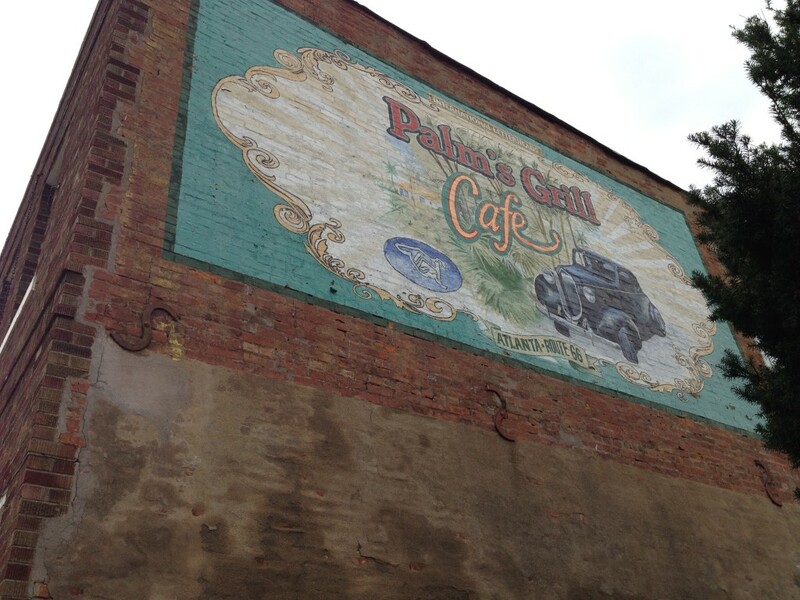 Nearby, partially obscured by trees was an old mural advertisement for a business. A short while down the road we came upon another larger than life man. 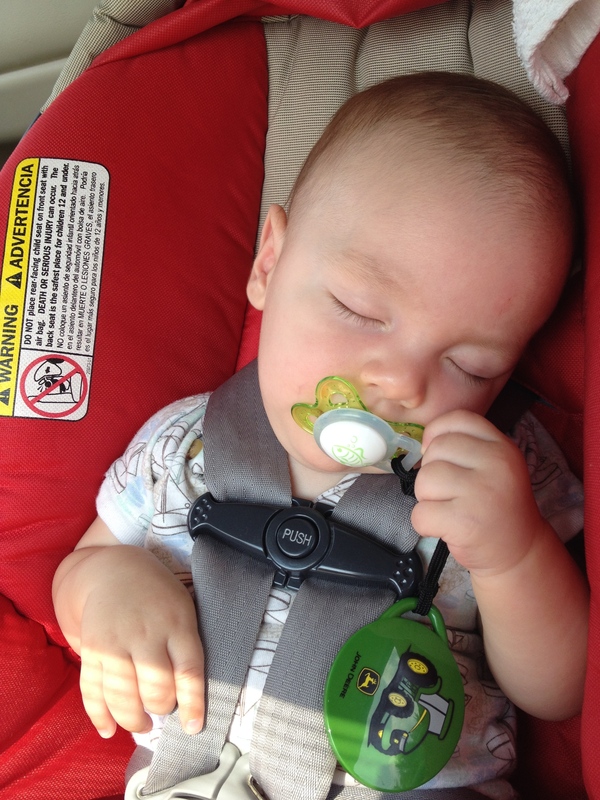 While Frugal Boy slept for most of the car ride, these scattered diversions would be great for kids. Not only does it give them a chance to get out and run around for a bit, it also provides points of reference for future traveling. Now when I drive past these towns on the interstate, I will be able to remember something about them and the whole trip will go by a little bit faster. Well Mr. Giant Lincoln, how about we visit your last residence. Okay, maybe a recreation of your last house, because that was the first place that we visited upon reaching Springfield. 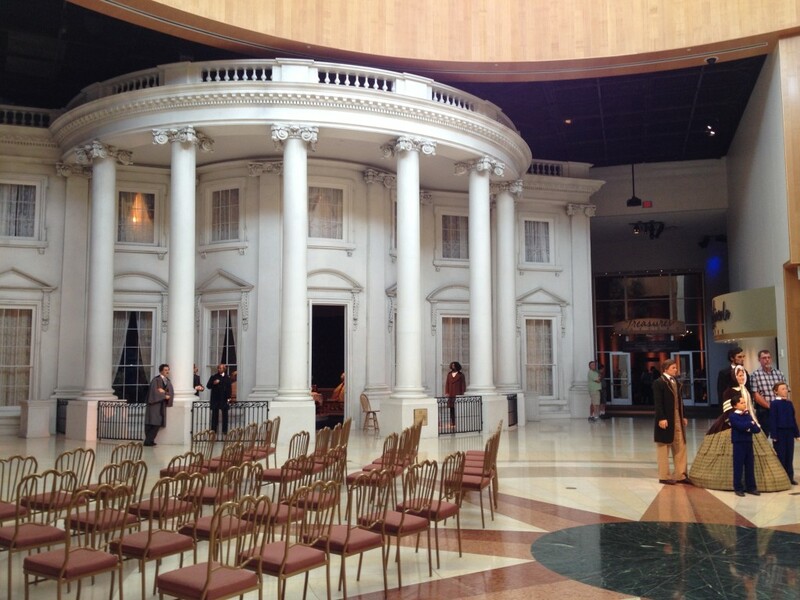 The Abraham Lincoln Presidential Museum in Springfield, IL tells the story of our 16th president from his humble beginnings in Kentucky and Indiana to his rather tumultuous political career in Illinois and Washington D.C. The museum is definitely worth a visit and seeing as photography was disallowed in most areas, you will have to see it for yourselves. Plan your visit during non peak days as the layout and flow of the museum can get a bit constipated. 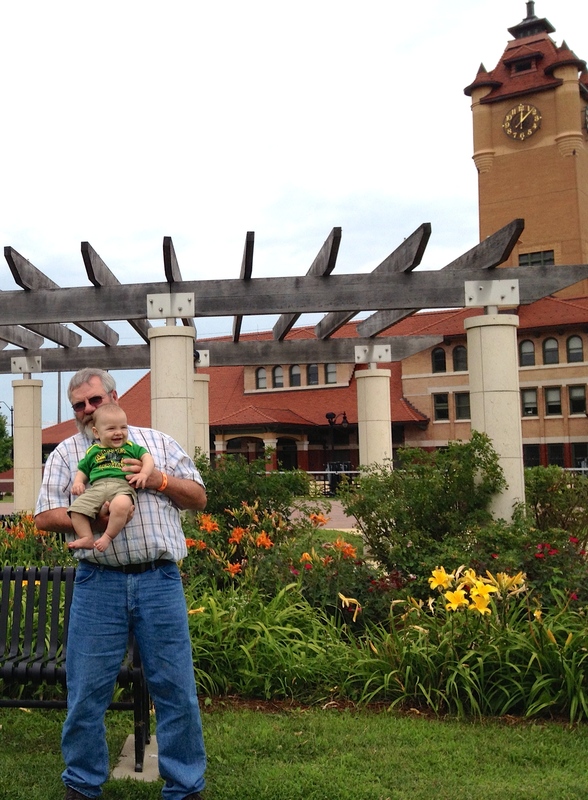 Outside of the museum, we paused for a quick photo op. 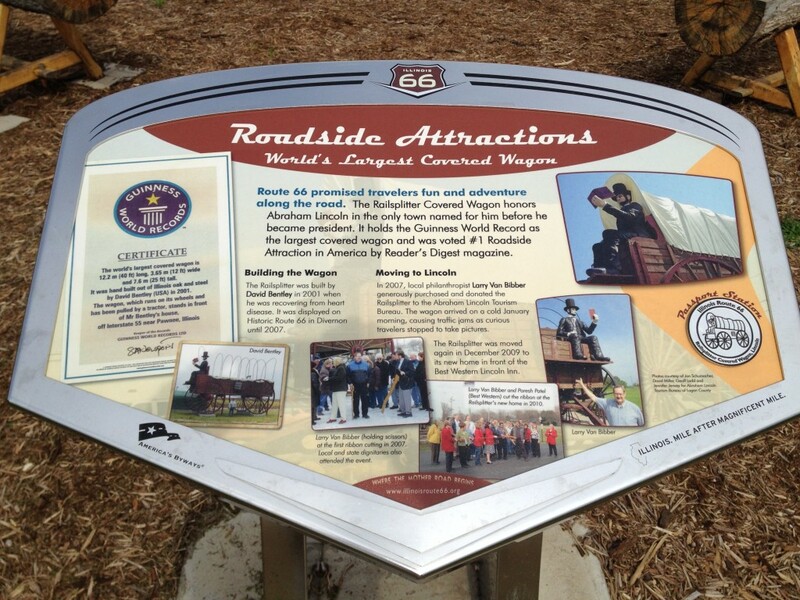 There are a number of attractions within walking distance. 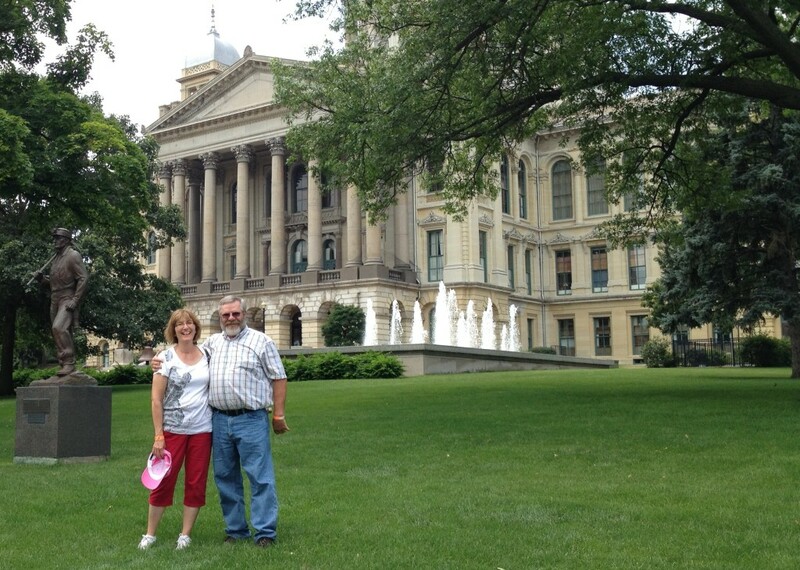 The first one we visited was the “old” state Capitol. 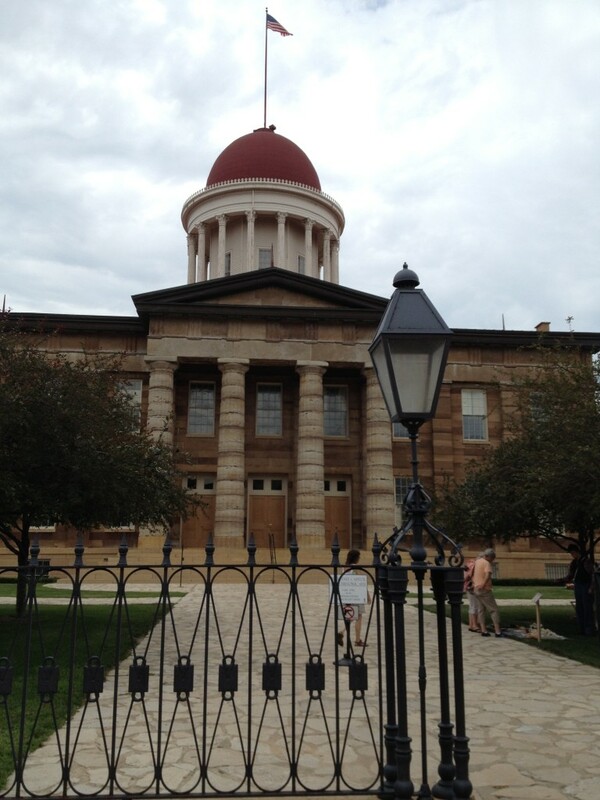 This was actually the 5th state capitol and the first one located in Springfield. The General Assembly was a tidy room. 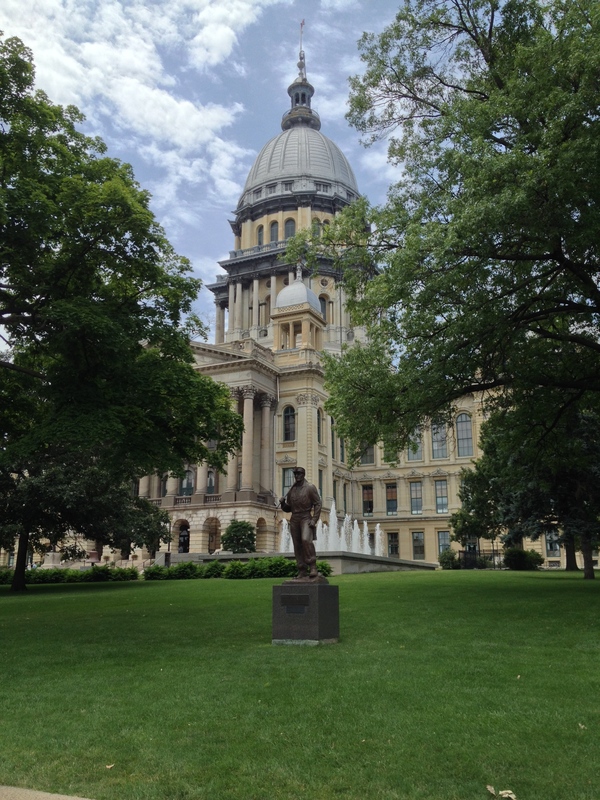 The 6th and latest state capitol, built after the Civil War, is a much larger building. 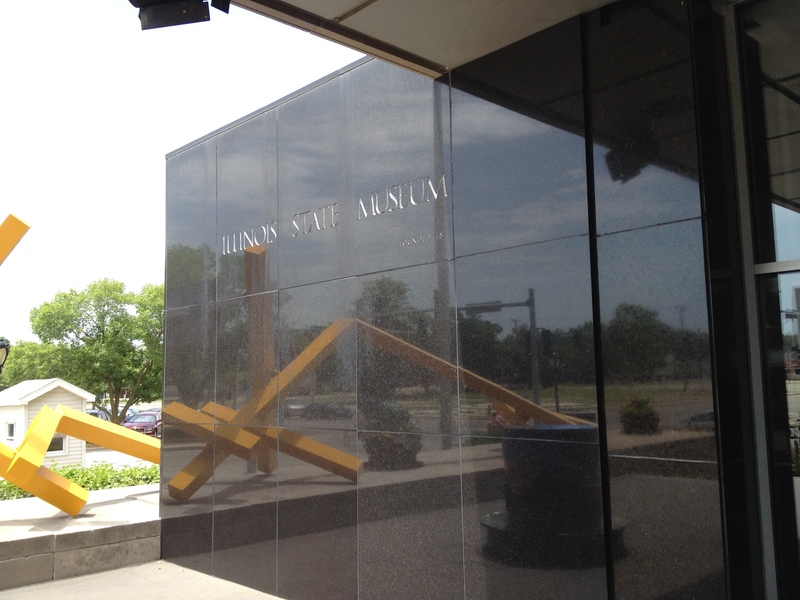 While we were trying to figure out where the handicap accessible entrance was (for Frugal Boy’s stroller) we somehow ended up at the Illinois State Museum. This free museum spans 3 levels. The basement houses a large hands on activity area for kids. 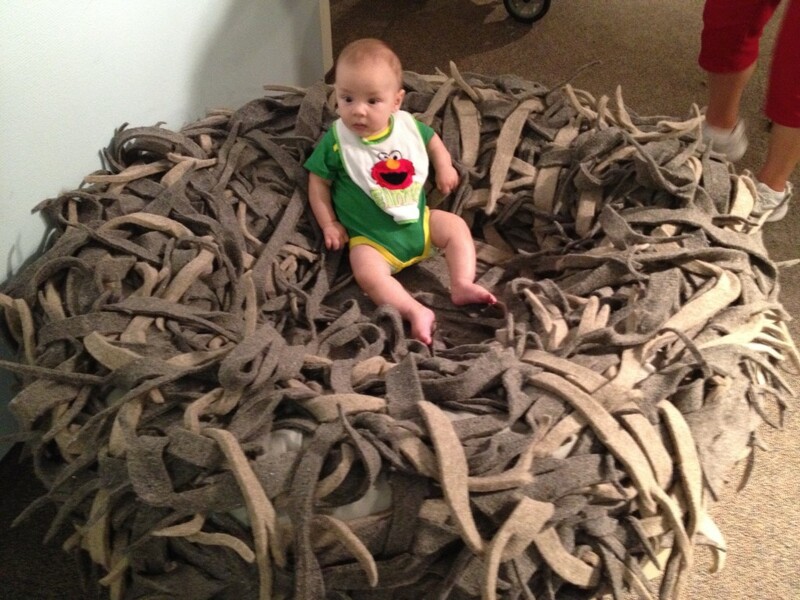 Frugal Boy found a comfy nest and waited for momma to feed him birdy style. 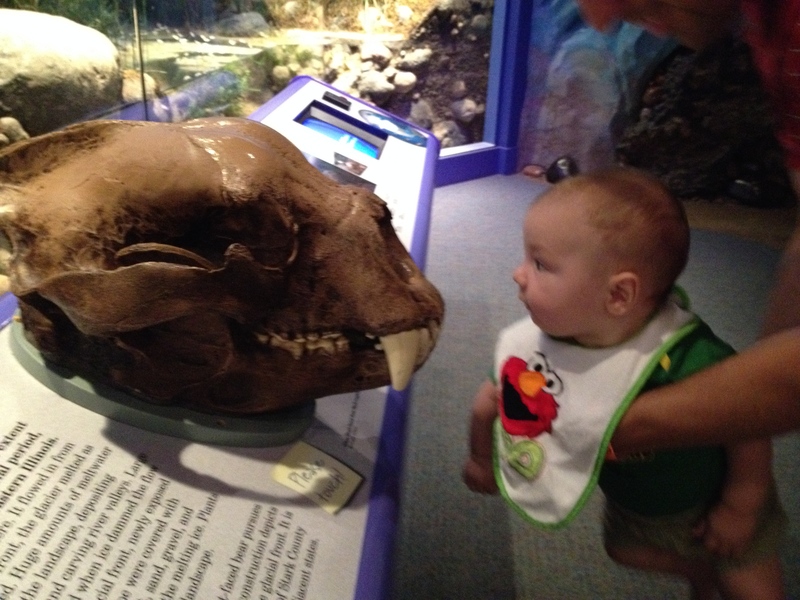 The main floor exhibit is centered around the natural history of the state. 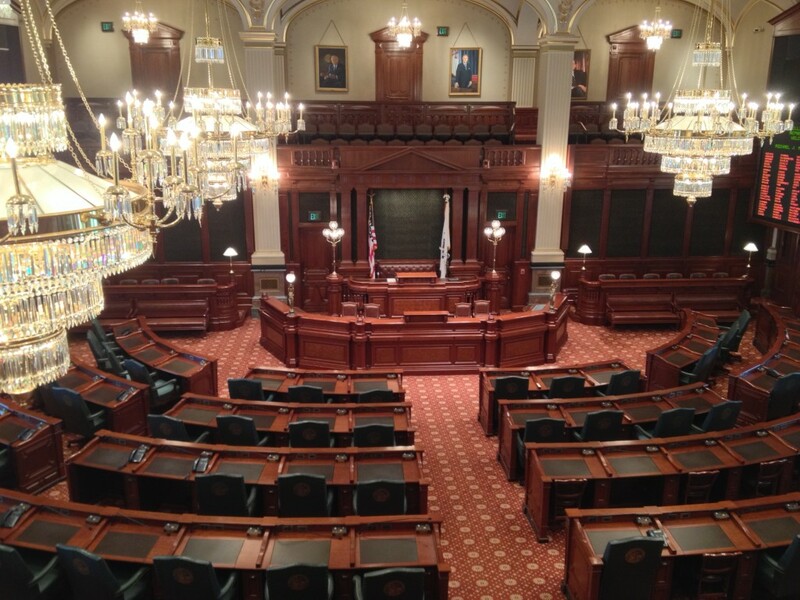 The second floor contains a couple of art exhibits, a homage to the Native Americans, and a small exhibit about the evolving Illinois home. 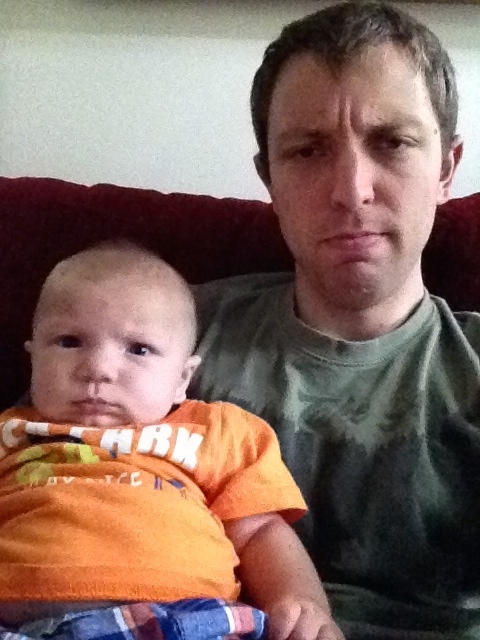 By this time, Frugal Boy was doing his best zombie impersonation and we decided it was time to move on. After scouting out the perimeter of the capitol building, we surrendered ourselves to the fact of dragging a stroller up some stairs and gained entrance. We had made it just in time for the last tour of the day and because it was a weekend you had to be a part of the tour to see anything past the first floor. 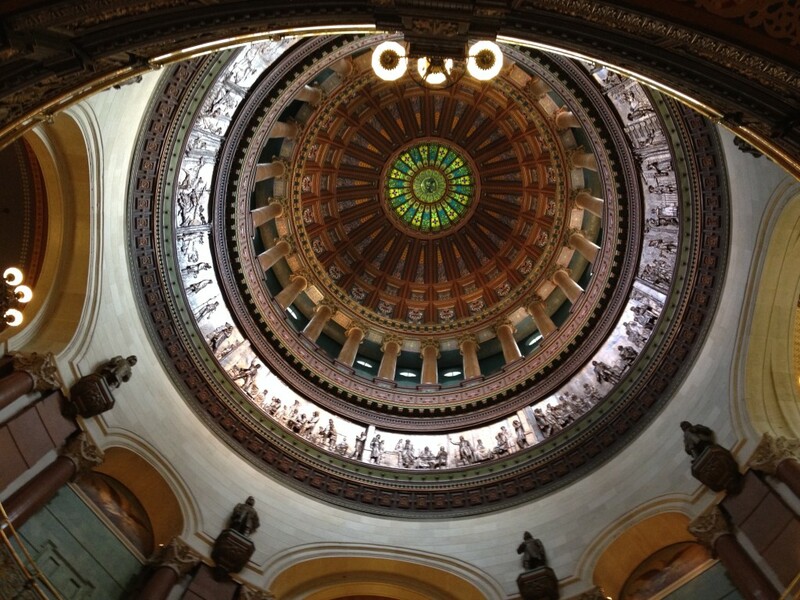 I have a soft spot for a big pretty rotunda. 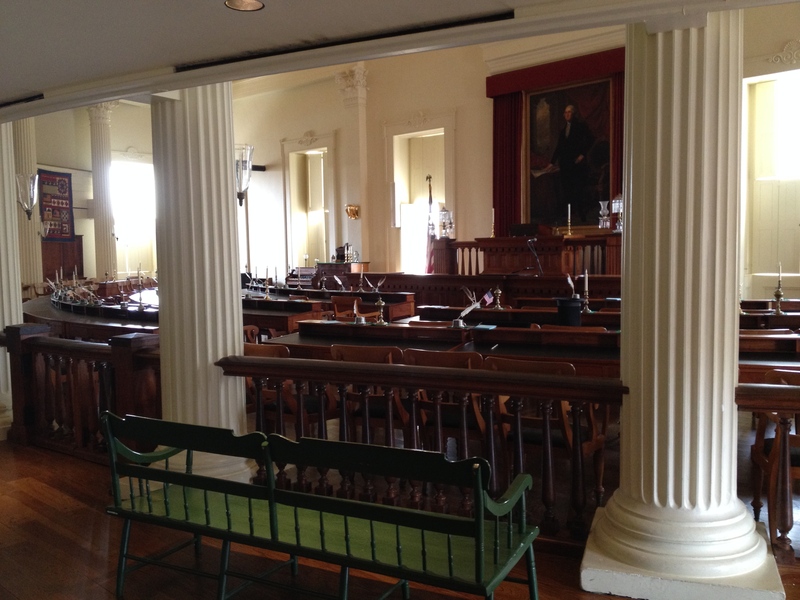 By the 1980s, due to a combination of gas lights and smoking, the entire rotunda was black. It took a massive cleaning effort to clean up the filth. Here is the current House of Representatives. 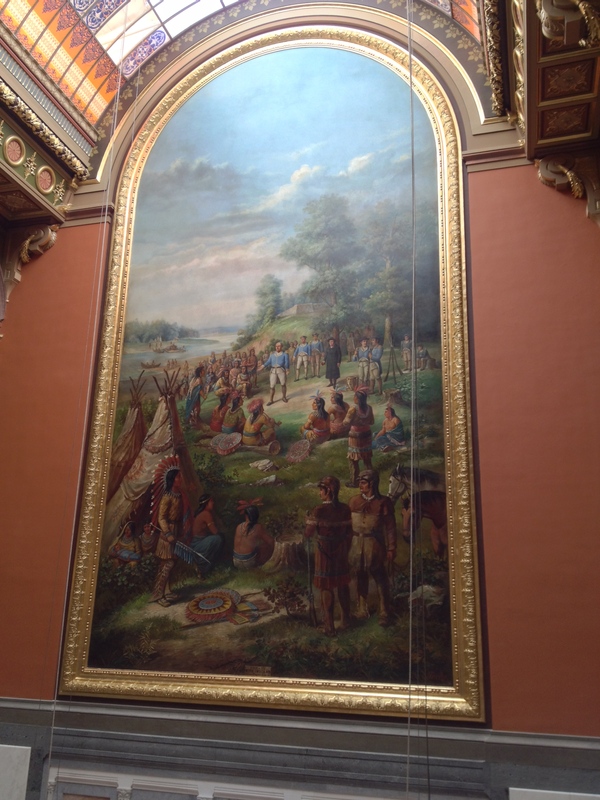 Near the end of the tour we saw the largest mural in the capitol depicting a peace treaty being signed with the native americans. In the 1800s the state spent $2000 on this mural. Today it is considered priceless (inflated cost of initial work is about $34.5k). 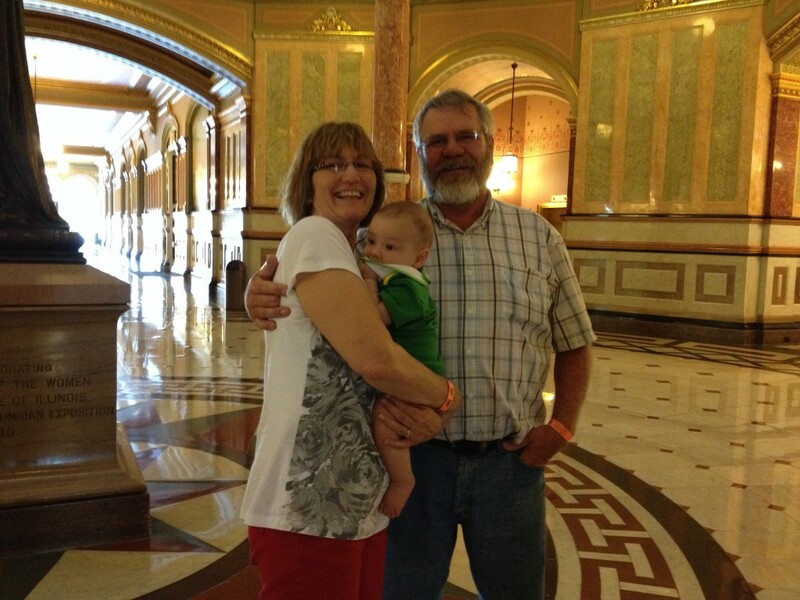 We had a great time and it was fun seeing a part of our state’s Capitol. 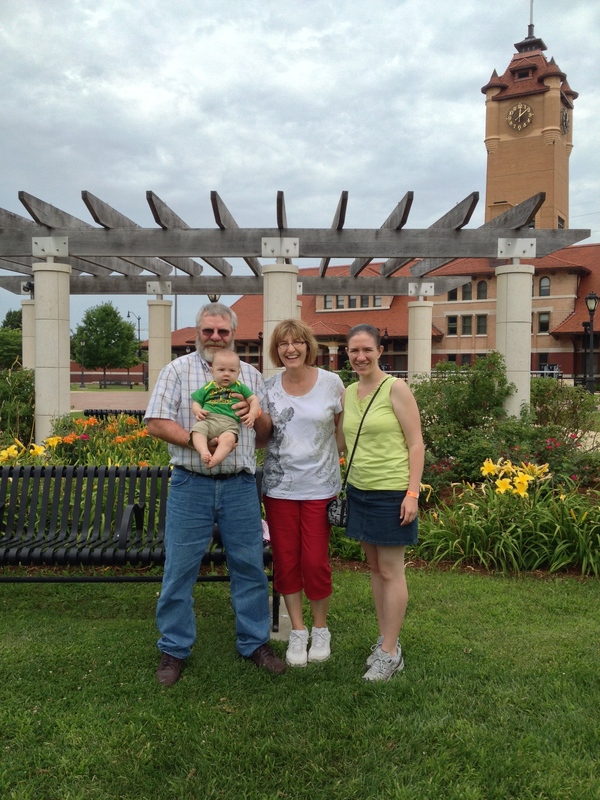 A big thanks to my in-laws for coming down and letting us tag along on a little adventure!